The start of a new year brings to mind so many fresh new possibilities! For many people, this is the time to make New Year’s resolutions, pledging to change something about themselves, or start something new. I have to admit that I’m not a fan of New Year’s resolutions. Though they may be begun with the best of intentions, they often fall to the wayside as the busyness of life takes its toll on us. If you are like me, you want something more permanent! are ready for something new. Sometimes we feel like our lives are stuck in a boring holding pattern, or we feel crushed under the weight of our responsibilities. Whatever is going on in our lives, we are yearning for something, so we take matters into our own hands. We make New Year’s resolutions hoping to create that newness that we are looking for; but when they don’t satisfy us, we let them go. What if we are sincerely looking for refreshment in our lives? What if we really want to make changes? Then we need to search deeper than just a better diet plan, more exercise, or a fun new hobby! We need to get closer to THE Source of true refreshment: A relationship with Jesus! Of course, the first step in a relationship with Jesus is salvation. Once you’ve taken that step, or if you already have, you will want to cultivate your relationship with Him to really enjoy the refreshment you are longing for. 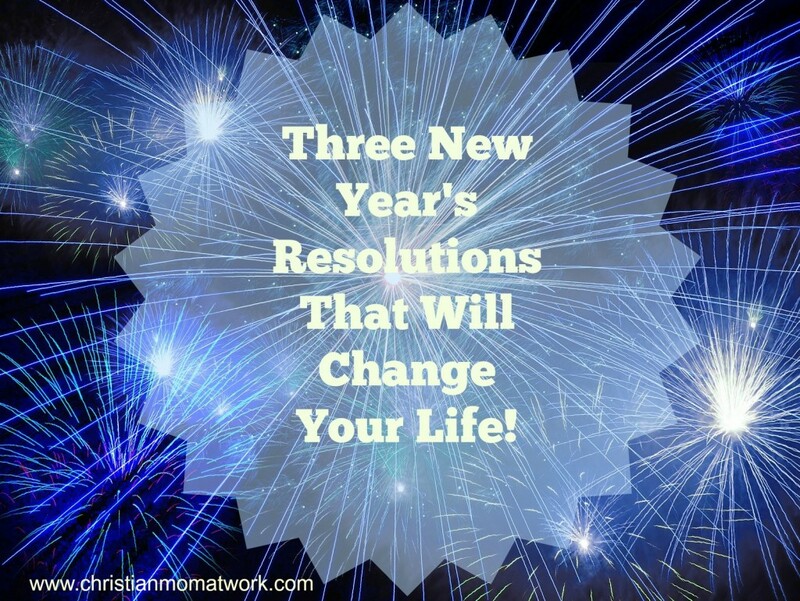 Here are three New Year’s Resolutions that will REALLY change your life! This is, by far, the most life-changing decision you can ever make! If you are not sure if you have given your life to Christ, you can read more about that here. When you make a goal, or resolution, the more specific you are, they more likely you are to accomplish it. If you’re not sure where to start, there are some great devotional books out there, like Putting on the Spirit, by Katie Horner. I also enjoy reading Our Daily Bread (which they will mail to you for free). If you do use a devotional format, make sure you don’t skip reading the actual Bible. It’s also a good idea to read the entire passage surrounding the verses used in the reading. It’s important to read things in context. Right now, I am reading in the New Testament, specifically the writings of Paul. It’s nice to see what God has to say without being led by a contemporary author. Though I do often find great inspiration from reading devotionals too! Again; be specific about how you are going to do this. Set aside a time that you know you will most likely have available. For me, it’s when I first wake up, right before I go to sleep, or while I’m driving. I need those moments when all is quiet; I am too easily distracted when others are around. Don’t make it all about you either! Keep a list of prayer requests. Let people know that you are willing to pray for them. You might be amazed at how encouraged people (saved and unsaved) are when you ask them how you can pray for them! But, if you say you will pray for someone, do it! Its so easy to get caught up in the moment and make a promise to pray. Why not pray with them right then and there? Or make yourself a note to add them to your prayer list, or pray for them at a specific time. A an inspirational planner might even help you stay on track. I know I have been guilty of saying I will pray for someone and then forgot to do it. Be faithful to your promise! If you want to make some New Year’s Resolutions, the three above are the best ones that I can think of! Nothing will leave you more refreshed than deepening your relationship with Jesus!